Storing documents on file sharing services like Dropbox and Google Drive has become a common practice online in the last five years. In that time, as people create, edit and hoard older data files, they find they are running short of the free space included with an account. With more and more people opting for either a tablet-only existence or switching from a traditional desktop computer with multiple internal drives to a laptop with a much smaller SSD drive, finding an alternate storage system is important. At a cost of between $0.05 and $0.10 per gigabyte per month for additional online storage, you can spend anywhere from $500 to $600 per year for just 1 terabyte. As you will see, a more economical solution is to own your own personal cloud hosted on your home network. Not every solution to this problem is perfect. The following outlines some of the challenges you may face when managing your own personal cloud. Upload speed – What is likely to be the biggest deterrent from using a home-based personal-cloud storage system will be your internet provider. When you are away from your home network, the fastest access speed you can expect from a personal cloud will be your internet connection’s upload speed. Looking at data collected by OOKLA, the national average for download speeds is about 21.5Mbps while the upload speed is only 6.8Mbps. For my own home network, those numbers are 18Mbps down and 2Mbps up respectively, which is where they should be according to my provider AT&T U-verse. Before investing in a personal cloud, run an internet speed test to see just how fast, or slow, your upload speeds will be. Router settings – Your router plays an important part in the equation as well. By design, routers are meant to connect multiple devices on your home network to the internet, and not the other way around. If you happens to have a router that supports Universal Plug and Play (UPnP) you many simply need to ensure that this particular feature is turned on. Otherwise you may find yourself manually configuring the necessary Port Forwarding settings that are unique to each private cloud and router combination. Take a quick look at both products’ support site before you buy. You should find a list of compatible routers that work with the personal cloud product you are most interested in. Remote access vs syncing – Syncing your files may be just fine when you think of a free Dropbox account. Files are typically accessed from a single user whose account comes with a relatively small amount of storage space. But when you realize that personal cloud based storage can have from 1 to 4 terabytes of space (some four-bay systems with as much as 16 terabytes), syncing is no longer a viable option. Keeping the majority of your files on your personal cloud means that both you and your cloud must be online in order to access your files. 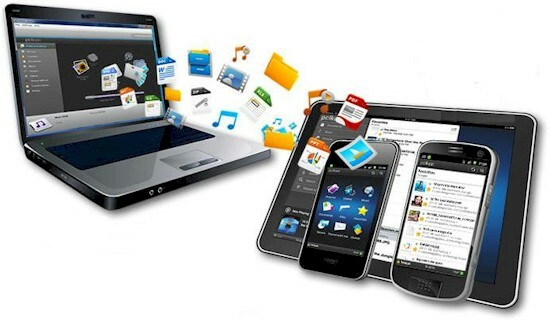 There are of course many different ways to share files between computers and portable devices. With personal cloud software installed on your computer, you can more easily access the files located on your home-bound computer from across the internet. Polkast is one such service that will allow you to share the files located on just one computer with a free account. Setting up an account and downloading the required software onto your PC or Mac is easy enough and there are apps for both Android and iOS. If you are looking to add more computers to the service, Polkast Pro costs $4.99/month or $49.99/year for an unlimited number of devices. LogMeIn Pro also has a file-sharing feature in addition to its remote control service. With LogMeIn you not only do you have access to your files, but you can also log in and control your desktop. At $99 per year for the first two computers, it is a little more expensive than Polkast but you may find it a little easier to use. Spotdox is a unique offering in that it is an add-on application to your Dropbox account. With Spotdox you can access all of the files from your home computer as it uses your Dropbox account to perform a sort of handshake to establish a connection. At $24 per year or $79 for life for an unlimited number of devices, this may be the most economical solution of the three. Leaving a computer on all of the time on your home network may not be possible. All you really need to do is attach just the hard drive to your home network. Such a device is called Network Attached Storage (NAS). NAS devices have gotten a whole lot smarter as they can now easily share their files outside of your home network over the internet. Transporter was among the first such devices that turned a network attached hard drive into a cloud accessible file sharing device. With their own Selective Sync feature, you can decide which folders you sync and which folders you keep on the device. Starting at just $99 for a diskless version that you add your own UBB drive to, you can also get a 1TB version for $249 or a 2TB version for $349. Transporter is by far one of the easiest personal cloud devices to setup. Zyxel NSA325 may be a lesser known brand, but has a highly adaptable configuration. Using Polkast as one of its cloud sharing options, you can also install a WordPress server and many other network services including a DLNA media server. It is more like a small Linux server than it is just a networked hard drive. Starting at around $75 for a 1-bay drive enclosure and $175 for a 2-bay enclosure (you supply the hard drives), this setup is geared more towards someone whom is comfortable setting up and configuring electronic devices. Western Digital MyCloud offers easy setup out of the box like Transporter and yet still has some of the advanced features available in the Zyxel like being a fully fledged DLNA media server too. Starting at $150 for 2TB, $170 for 3TB, and $220 for 4TB, you can elect to move up to WD’s EX4 network appliance that has configurations all the way up to 16TB for $999. A final solution would be to actually carry your cloud based storage around with you. Lacking the ability to create a sharable link on the internet, these devices will attach themselves to an existing Wi-Fi network or will create their own when none exists. This eliminates the complexities of having to deal with upload speeds and router configurations. Think of them more as like an on-demand personal cloud that you can carry around with you rather than leaving one attached to your home network. Kingston Wi-Drive does not have the same capacity as some of the other personal cloud options, but makes up for that by being accessible in locations where there is not internet connection. With storage capacities of just 32 GB for $80 and 64 GB for $99, you end up paying a premium for the convenience of being accessible anywhere. SanDisk Connect Wireless Media Drive takes things one step further by also allow you to connect to an inserted SD memory card. With a price point similar to that of the Kingston at $80 for the 32 GB and $99 for the 64 GB, having the ability to add-on storage makes the SanDisk a better option. Corsair Voyager Air is a little bit larger than either the Kingston or the SanDisk, but with that increase in size comes an increase in storage capacity. You can also attach the drive to your home network with an Ethernet cable. Priced at $180 for a 1 TB drive, byte for byte it is definitely the most economical solution of the three. Nice article to get you started. Sending anything to a remote site managed by a cloud storage company makes your data vulnerable to section 2-15 of the Patriot Act. Your data can be accessed and retrieved without having to give you any notice whatsoever. Be careful where you store your data if you want it private. If not, then off site cloud backups are very handy. this was very informative and useful. had no idea some of these options existed. for a small company that has several outsourced people needing to access various files, wishing to keep each file current and within the owner’s control, what would you recommend? also, if all files reside in one place, what sort of back-up exists for this, running mirror drives? You mentioned you have AT&T U-Verse then the NSA325 device. My AT&T U-Verse router will not recognize the NSA325 storage unit. Did you get this to work? If so, how? I have since switched to Time Warner and now have a different network configuration. I now have a Ubee/Ambit DVW3201B cable modem/router that has drastically improved my network performance. That and the fact that I now have 50MB down and 8MB up. AT&T does not offer anything faster then 18MB down and 2MB up in my area. In so far as the AT&T router not recognizing your NSA325, even when running with AT&T I had my Apple Time Capsule set up in bridge mode, so the NSA325 was never actually on the same ethernet switch as the modem/router. I did not modify my modem/router or my Time Capsule. Everything just worked for me back then. Call it what you want … but it isn’t “cloud”. It is just network storage device. Read MrAnon’s comment for more info. Have you checked out ownCloud? Strangely no mention of the pretty obvious free personal cloud solutions: Tonido for unlimited remote filesystem access and BitTorrent Sync for unlimited folder/file syncing. There’s no way I’d pay for a cloud service or client if I’m providing my own hardware. I am also using a dedicated server, but looking forward to something more electricity wise for a 24/7 use. It’s not the best deal to keep it on if you don’t have something important to store. Or buy a beagleboard/raspberry pi set up ssh, attach external hard drive, disable insecure upnp, forward port 22 for ssh to the beagleboard/raspberry pi, and you got a very secure low cost personal cloud… can also serve up media VIA dnla and torrent at the same time. The primary reason I store my data in the cloud is to protect it should my home office computer and external drives be stolen or destroyed. The cost of storing data is also much less than stated in this article. I pay Crashplan less than $5 per month for unlimited data storage. I protect more than one computer at that price by backing-up my MacBook Pro to an external drive connected to my primary computer; the connected drives are included in my subscription. Combined with the pitfalls detailed in the article it is obvious to me that setting up your own “cloud” data storage system is a waste of time and money while unnecessarily putting your data at risk. got a pogoplug and a hitachi solution. both cost less than $20 each and simply works. One of the features that online storage offers over local storage is an enhanced level of security by storing your data at an off-site remote location. Probably not a huge concern for most but it is a factor to consider. It’s almost a crime to leave the Synology NAS off this list. It is by far the simplest want to use. It also includes simple off-site storage through Amazon glacier. It includes Cloud agent which allows you to have exact duplicate of dropbox functionality. I decided on this NAS after researching all the options from Dropbox (cost just like you said) to building a server (you can’t build your own photo sync client for iOS). What about smartphones? Does it have the same functionality like automatic uploads from the Camera Roll? I bought a MYCLOUD…………… DONT!!!!! its slow crappy and barely works. I’m returning mine. Ive bought a lot go technology over the years this is the first piece of junk i wanted to smash. I have to agree. While the service from WD is very good, the product leaves a lot to be desired. It crawls and has a hard time working with multiple devices on the local network. I did not even try to access it over the Internet before returning it. And…with WD MyCloud you have to provide your login information to WD, so they manage accounts that connect into YOUR cloud. I looked long and hard at WD MyCloud, and was hovering over the “submit” (to purchase via Amazon) button…a little voice just said NO. I purchased a 4Terabyte drive and have it connected directly to my router, and set up DDNS on the router to the device. In this manner I have both a NAS, and a personal cloud, where I manage the accounts that have access and own and control the data, as well as no additional $$ outlay for a Cloud Service. I can HTTPS or FTP into the device from outside my network, my home connection from ISP is 50mbps/25mbps FiOS. Drag and drop within (inside) my home network is great, my backup software recognizes and can use a network drive – word of caution here…many companies offer software backup with their drives, but if the drive is a network drive it may not be recognized and requires the device to be on a computer where the software is running, in addition some of that software backup ONLY backs up files, not the system so if you had to recover your system and data you are out of luck. Choose wisely. It’s a little outside the typical consumer space, but “dedicated server” is also a viable category. I’m using a Linux server configured with RAID10 running Seafile as a personal cloud.